It has been estimated that the average American household contains more than a quarter of a million items. That’s a lot of stuff! Now, try moving all of those items – every single one of them – across the country. If you aren’t sweating a little right now, then you probably are not planning such a move. Moving your family – and your household – across the nation, takes planning and preparation. A big move like this generally takes at least two months. So, where do you begin? Here are some moving tips that can help the process go much more easily. If you don’t love it and haven’t used it lately, then get rid of it. From extra coffee mugs to kids’ outgrown toys, get rid of every single item that you can live without. Research shows that most of us only use about 20 percent of what we own, so why hold onto it? Packing and moving items that don’t mean all that much to you is a waste of time, energy and money. Ease your stress and save costs by paring down your belongings as much as possible. Do not pack a single item until it has been thoroughly cleaned. It may seem like an unnecessary step when there is so much work to do, but it will mean less work when you get to your new home. Professional moving services like Zippy Shell are experts at long-distance moves, but that does not mean that improperly packed boxes won’t get damaged. Invest in high quality, standard sized moving boxes to ensure that everything will fit into your moving shell, and your possessions will arrive safely at their new home. Be sure to label every box so that it can be found once you get to your destination. 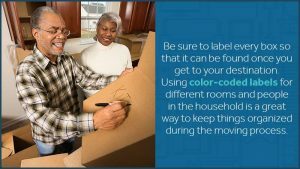 Using color-coded labels for different rooms and people in the household is a great way to keep things organized during the moving process. Also, be sure to keep a detailed inventory of each box just in case anything gets misplaced. Depending on your circumstances, you may decide not to take everything with you to your new home. Items you won’t need for awhile may be best kept in a storage area. Simply order a long term storage unit from Zippy Shell that can be filled right at your current home. Once loaded, the shell will be taken to a climate controlled storage facility in your new area, keeping those rarely-used items out of your way until they are needed. When you are ready, simply call Zippy Shell and we will bring the fully packed shell right to your door! Whether it is for a few weeks, a few months or a few years, Zippy Shell offers a myriad of long-term storage options. Consider the services provided. Not every moving company can handle a cross-country trek. Be sure that any company you consider can offer the kind of service you need. Ask about safety. You want to make sure that your moving truck will not be left unattended at any time during the trip. Inquire about safety protocols. Consider the timing. 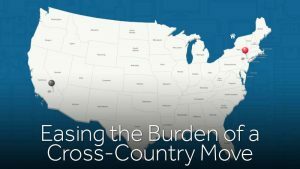 How long will it take the movers to get your possessions across the country? Remember, you will be living without your possessions until they arrive. Look at the value. Cost is important when choosing a moving services company. Long-distance moves are not cheap, and cost must be considered. That’s why Zippy Shell guarantees that we’ll beat any competitor’s price by 20 percent. Planning a cross-country move takes time, patience and a lot of energy. But if you follow the tips outlined here, you should be able to keep your stress levels at a minimum and enjoy the process of moving to a whole new area and new home.